Lucy Hansson was ready for a perfect summer with her boyfriend, working at her childhood Bible camp on the lake. But when her mom's cancer reappears, Lucy falters, in faith, in love, and in her ability to cope. When her boyfriend pauses their relationship and her summer job switches to a different camp, one for troubled kids, Lucy isn’t sure how much more she can handle. Attempting to accept a new normal, Lucy slowly regains footing among her vibrant, diverse coworkers, Sundays with her mom, and a crush on a fellow counselor. But when long hidden family secrets emerge, can Lucy set aside her problems and discover what grace really means? Emery Lord is a prolific contemporary author, creating socially conscious characters with compassion and consideration. 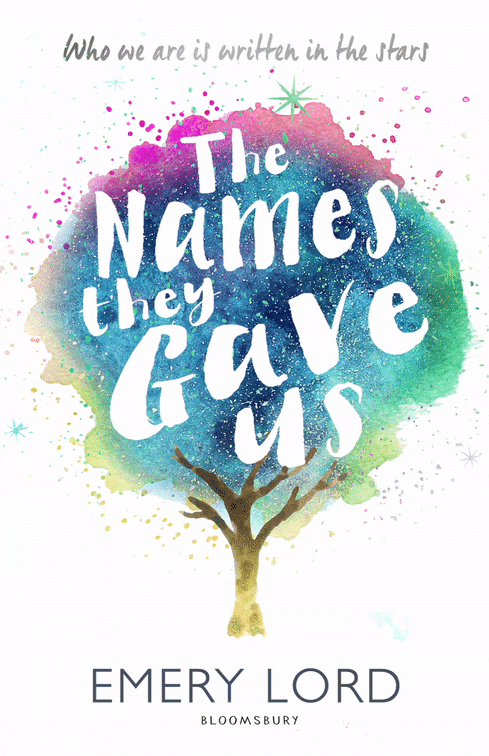 The Names They Gave Us is marvelously delightful, beautifully written and enchanting. This is such a beautiful review, Kelly. You touched on every aspect that I loved about the story. I liked that she challenged her Christianity, but also she never lost her faith. I adored the secondary characters so much. They were a terrific cast! Thank you darling girl. Wasn't it lovely! I usually shy away from books containing religion, it's not usually portrayed all that well in young adult. But this was delightfully surprising. I loved that Lucy questioned her beliefs and that's probably something that wouldn't have occurred if she hadn't been at Daybreak. And how about that Henry! I absolutely adored this character. Absolutely thrilled you loved this one too. This sounds a bit deeper than her usual. I haven't had any luck with her last couple of releases so looking to change that with this book. It's still light contemporary romance Joy but seeing so many vibrant, diverse characters surprised me. I was so delighted with this one. I'm so excited for this, so I'm glad you enjoyed it, that means I'll probably enjoy it too. It sounds important and beautiful! It was really delightful Megan, I would love to see what you think of it! Ooohhh I like all that representation you've mentioned that's in there! It was wonderfully diverse. I'm hoping she'll revisit Daybreak to follow other characters on their journeys to healing. Hello there Anisha! I thought you might have gotten lost. It's such a wonderful read isn't it, really looking forward to reading your thoughts on it. I hadn't heard of this one before but it certainly sounds like a book I would enjoy. I am going to go add it to my Goodreads now. Great review, thanks for sharing your thoughts. Thanks Rochelle and so lovely to see you again. It's a beautiful read with lots of heart. It truly is Karen, so heartening and a pleasure to read. I hear you about the ending. I really enjoyed the book itself focuses on the characters journey rather than Lucy's moms illness. It was really smartly done and made this book stand out. But the ending was far too abrupt. I got some of the logic behind why it was that way but, to me, it felt like there was still more story to tell. I felt exactly the same way Becky. I understand why but there were a few loose ends like the reveal towards the end, that weren't spoken about and I was a little, what happened there? Why was that included? But overall I really enjoyed it too. It's one of those books that's tender and really lovely. The romance will have you smiling to yourself and so wonderfully diverse. I'm really Hoping Emery Lord visits Daybreak again to follow some of the other characters. Sounds really well done! Thanks so much for sharing. I really need to read this author. I keep meaning too! It will happen. I love that the overall theme is compassion. It's beautifully written Lauren. This is my second Emery Lord book and she's now becoming one of my favourite authors. Thank you so much Zoe and I'd love to see you pick this one up. I think you would really enjoy it. Thanks Ailyn. Yeah, it's a bit too open ended and felt as though a few loose ends needed addressing. Apart from that it was lovely. I pretty much shy away from YA books like this lately, but this sounds wonderful. I liked The Start of You and Me, and this looks even better. I assumed it was a YA book about cancer and having faith but I was completely wrong and absolutely delighted. Those are very small aspects of the storyline. It's truly lovely Christy, I would love to see what you think of it. Aw, what an abrupt ending this must've been -- but everything before is beautiful from your review. What a genuinely lovely book this sounds like! It's beautiful and I'm hoping due to the ending that she might revisit camp Daybreak again. I like how the book mixes up Christian faith and adoloscent doubts in the minds of teenagers. Though i admit I would have loved to have some closure. thanks for informing me about my website Kelly. It means alot. I will be trouble shooting it and being extra cautious this week. Hopefully it's fixed soon sweetheart. This is such a lovely read, would love to see what you think of it. Very few young adult releases talk about religion in such a positive light. It's stunning isn't it. She always has lovely covers. A Wonderful read as well. I haven't actually read anything by Emery Lord, Yet! I tend to stay away from books with religious tones, but this sounds like it's written beautifully. Wonderful review. You peeked my interest. Same Sarah but it was only a small element of the storyline. She's such a wonderful author, this has been my favourite of hers to date. I definitely agree about the lack of closure. It seemed as if it were supposed to be a cliffhanger. Thanks for a lovely and in-depth review! Lovely to meet you Breeny. The best piece of advice I received when I first started blogging was to try to engage with your readers. Not only do you make friends but you're an active part of an online community where you can talk about books with other passionate readers too. It's such a lovely read Joy, really positive. I was worried about the religious aspects because I've found in young adult they can often come across as preaching to readers but it was such a welcome addition actually. I really like your review! I'm a bit "afraid" of reading books about religion because I think they can get boring sometimes. Also the cover is amazing! They can also seem to preach to readers I've found but this isn't the case at all. it's such a delight to read and that cover is gorgeous isn't it!